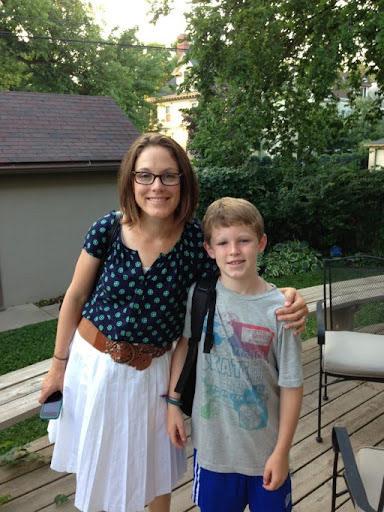 This is not a good picture of me, but it documents Shef's and my first day of school. He's in 4th grade now. I'm a 6th and 7th grade teacher. It's my first year teaching 6th grade and being a 6th grade advisor. It turns out I really like those 11 year-olds. They're supper Q-ute. It's going to be an EPIC year. That's my motto and acronym. When I tell you what it stands for, your hunch that I'm a complete dork will be confirmed. It stands for Everyday Positive Interactions and Communications. I'm dorkitude embodied. Here's what happens in the evening: I put Mac to bed at 8pm. Then, Shef frequently wants to come with me to walk the dog. During the walk, he yaks my ear off about whatever thing - camp or 4th grade or the smell and quantity of various farts. You know. Typical stuff. I love it. Last night it was dark, and I found myself staring hard at the strip of grass where Skip had last squatted, as I couldn't find the feces. Suddenly a car pulled over and shined its headlights at us. 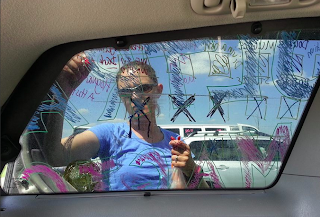 A woman leaned out of the passenger side window and yelled, "We're helping you find your poop!" "That's very helpful!" I yelled back. "Thanks!" But still, after like 30 seconds of looking, I still couldn't find it. The dog is small, the poop is small, and the grass was tall. "I still can't find it!" I shouted, apologetically. "Well," said the woman. "Good try!" I'm on day three of a new meditation regimen. My doctor recommended it, and a little web research shows that basically 100% of neuroscientists, psychologists, and other health care providers agree that meditation is beneficial for all aspects of well-being. Unlike the juice cleanse that I'm also considering, this is an easy and uncomplicated decision. A friend recommended an app called Headspace. All you have to do is download the app, and you get a free ten-day programme. They spell it that way because they're from the UK. On the recordings, Andy, a former monk, leads you reassuringly through beginners' meditations. The only problem I can forsee with my new endeavor is that I'm becoming obsessed with the benefits of meditation. I think that's kind of counter to the goal of freeing my mind. I'll keep you posted. Glance in the rear-view mirror and see Mac with his foot in his mouth. Like, really, his pigglies were in there. "Gross!" I said. "What are you doing?" "Just trimmin' my toenails," he explained, happily. Have you heard of 3D printers? 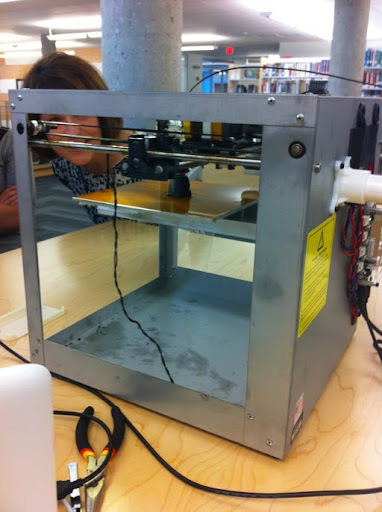 We went on a tour of the new science and design center at the Upper School campus of my school, and I saw a flipping 3D printer. That's it right up there. Do you know what it's doing? It's printing a statue of a cat. It's printing that because the librarians programmed it using a design software thingy. The new library is in the science wing, and it is aMAZing. Modern, light, colorful, inspiring. Don't tell my boss, but I walked into it, hugged the librarian, and asked, "Are you guys hiring up here?" I have some truly excellent news: the 6th grade team is teaching with Chromebooks this year. A Chromebook is a cool laptop computer that runs Google Chrome and lots of web apps. It costs $249 dollars, is all. We are having a 2:1 program with them in 6th grade Humanities class. Did you know I'm a Humanitites teacher these days? It's pretty cool. So cool, I didn't even mind the Chromebook training as the bizillionth meeting of this workshop week day. I finally got the opportunity to ask my friendly G.P. about an alarming growth on my head. It feels like a dangerous pea-sized tumor that wiggles under my finger when I obsessively palpate it. Doc checked it out and offered a quick diagnosis. "It's a sebaceous cyst," she said, confidently. "So, it's not cancer, then?" I confirmed. "No," she said. "It's more like a big zit." Good to know. I can't pop it, but it won't kill me. Ok, yes, I know "Just Do It" is a marketing slogan designed to manipulate me, but in this case it's apt. 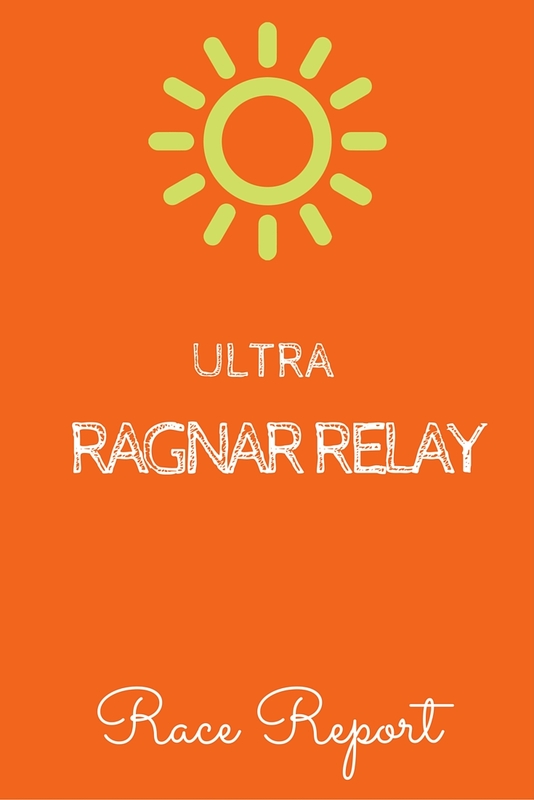 I ran the Ultra Ragar Relay, and I feel confident in saying it was the hardest endurance event I've attempted. You know how it works, right? You show up at the starting line in Winona, MN. In a regular relay, there are 12 peeps. 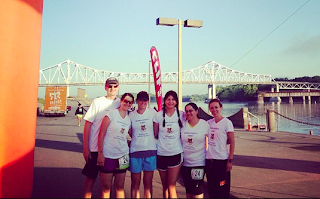 Our team had 6, hence the "Ultra" designation. One of your members (me, in this case) lines up under that puffy orange starting line and runs away, following signs that eventually lead to Minneapolis, which is 203 miles down the road. Everyone else gets in the van and follows along. Later, when that first person has finished running about 8 miles, she hands off the baton (a bright orange slap bracelet) to another person on the team (in this case, Tom) and then gets in the van. You eat, drive, and doze as you're able. You keep doing this, running various distances ranging from 3.1 miles to 9.4 miles at a time, until you get to Minneapolis. You do not stop. You (or, I guess I should say I) talk a lot about how much gas you have and whether you've accomplished any significant evacuations in any of the port-o-lets that populate the exchange zones. (The race specifies that defecating in public is completely forbidden, so the Biffs are the only option.) You take Aleve and Ibuprofen and worry about the heat. You try super hard and attempt to appear cheerful when your van stops to encourage you. Eventually (in this case before Leg 5, when you've already run 25 miles), you start using swear words in 100% of your sentences and wonder (sometimes aloud) why you're spending time and money and emotional energy on this ridiculous endeavor. Your teammates start to say stuff like, "Ok, but you're going to go, right? Because I'm not running any of your legs." You laugh maniacally and agree to take the handoff (in this case, from Liz). 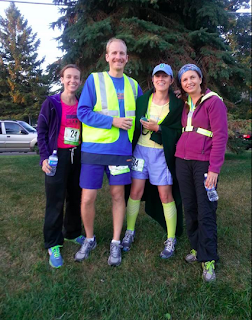 Later, after you've had a near-death experience on Leg 6, and your team says, "You looked like you needed a minute," you get back in the van and report that your quads are no longer functional. Later, you announce to the world that you've finished running this stupid race by checking off the last leg on the outside of the van. You stuff your face with cheetohs while you're accomplishing this task. After you finish, you get a free beer that you immediately regret drinking. You go home, take some ibuprofen and sleep for 15 hours. I have to say, it was pretty cool. You guys, I'm pumped! 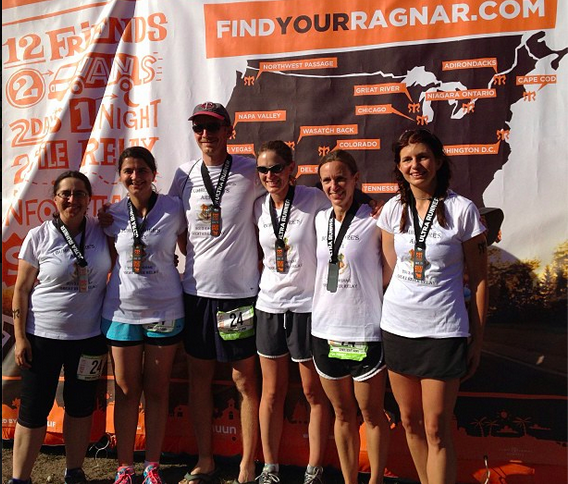 It's time for Ragnar Great River Relay. Last time I did this, I spent the hours in advance of departure bawling my eyes out because I didn't want to do the stupid race, and the people are crazy, and why did I ever agree to do it in the first place? This time, I'm so flipping excited! 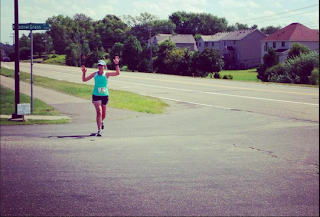 I'll be honest and admit that I haven't had (m)any breaks from my kids this summer, and even if my break comes while I run 36.6 miles in a 32-hour relay, I'll take it. 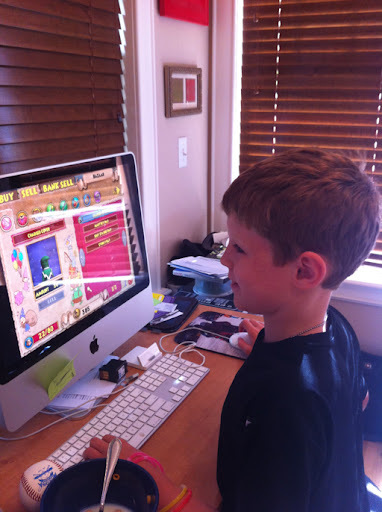 But, the other reasons I'm excited are related to super, crazy, awesome fun. 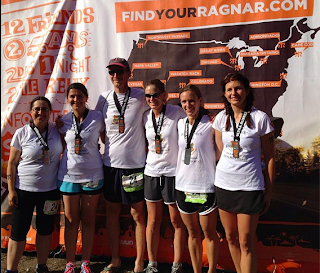 Teammate Jordan's husband asked if Ragnar is a hotbed for random roadside hook ups, and I can tell you with certainty that it definitely is NOT. We make fun in other ways and get your mind out of the gutter. You might want some more information. If that's the case, you can look at the maps of my legs HERE. I'm doing numbers 1, 7, 13, 19, 25, and 31. My team is called DUMBLEDORE'S ARMY, and we're committed to the victory of goodness and love over evil. YEAH! I'm going to go ahead and apologize in advance to my teamies for using expressions like Blimey! and Merlin's Beard! nonstop. It probably won't get old for me, unfortunately. You can follow on Twitter, if you want. WHEE! Picked Shef up from the camp bus yesterday. Usually the bus gets there around 12:15, so I took my time running errands and things before heading over to the appropriate parking lot. Turns out, this time the bus pulled in sometime before 11:45. I missed his dramatic descent from the coach! Darn it! Luckily, he's a camp vet and wasn't phased by my tardiness. "Were you sad that I wasn't there?" I asked, worriedly. "No," he said, shrugging. "I just sat on my bag and waited." Of course, he had great times at camp and isn't totally thrilled to be home yet, I'm afraid, even after I told him he could game as much as he wants. Yesterday, he came upstairs after like 15 minutes of being on the homefront. "What can I do?" he asked. "Well," I said. "You could do wakeboarding or archery or riflery or rock climbing or..." I don't think he thought I was that funny, to be honest. Today I was absent-mindedly rubbing my chin and I found something completely disgusting. It was a long, crinkly, wiry, black BEARD HAIR. Of course, I'm very vain and inspect my face on a daily basis. So, I think this beard must have grown overnight. I googled about "beard hairs growing long overnight," and I didn't find any satisfying results. I just finished working for three days at Camp Foley. En Route to Camp and then back to home, I listened to a fascinating book by Sal Khan called The One World Schoolhouse. I think I kind of love that book, actually. 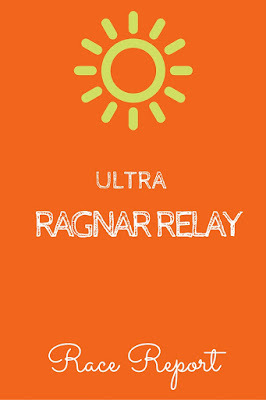 In three days, I'm leaving to go run the Ragnar Relay on an ultra team. I'll be running 36+ miles in 6 legs over 32ish hours. After that, school starts. I'm pretty excited for school to start. I need a little structure. I need less of being a stay-at-home mom. As of last weekend, Dan and I have been married for 11 years. Dan is a Twitter star, and I'm still not famous. I was really happy to find an awesome swimsuit this summer. Double score when I found it in Target in about two minutes. Triple score when it was only 20 bucks. The suit is what you'd call "full coverage." It's got a loose tankini top in a pink stripey pattern, and it has loose swim shorts on the bottom. They're sort of baggy. I love wearing the suit, basically. Super comfortable. I broke it out at the cabin the other weekend in front of my friend Adriana. She gave me a once over and made a face. "What are you, eighty?" She asked. "Someone your age should NOT be wearing that," she said, shaking her head. I recounted the story to my mom today at the waterpark while I was wearing the suit. She did not say that Adriana was wrong. Later a woman about twice my age asked me where I got it. Me: I think I have Lyme's Disease. I probably have Lyme's disease. Dan: Why would you say that? Me: I've been in tick-infested areas, and I'm very tired today. Dan: I think you're just sleepy. I found a calculator online that makes a guess about how tall your kid is going to be at age 18. The calculator confirmed that my two children are likely to slightly different. Here's how tall it said Shef would be at age 18: 6'3". He's already super tall. Taller than 91% of American boys his age. He's also heavier than 81% of American boys his age, which fits when you consider his height. Mac, on the other had, is considerably smaller. He's in the 59th percentile for height and the 20th for weight. I made a mistake on the calculator at first and thought he was going to be about 5'7" at age 18, but it turns out he's more likely to be 5'10". Aren't you happy to have your hands on this valuable information?! I sure am. This was an epic day. I went to a museum. With a friend. And we had delicious lunch and conversation and we looked at amazing works in glass by Swedish Artists at the American Swedish Institute. I did this instead of catering to my children's every whim. I hired someone to do that instead of doing it myself, just for today. 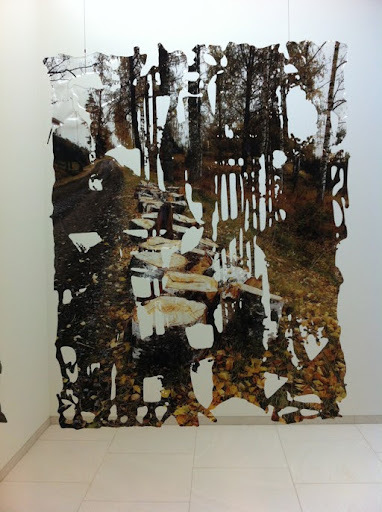 While I was at the Institute, I photographed this glass "postcard" by Ingalena Klenell. The holes in the image symbolize the holes in our perceptions and memories. Love that. When I got home, I got my back-to-school letter from the head of school. Should be a great year, I think. Seems like it's going to be Epic. Here's what's up: I'm doing another alphabet set. This is my cure for writer's block. In my life with my jobs - as teacher of middle schoolers and mom of elementary schoolers - I am almost never alone. I'm talking to people and being with people almost 100% of the time. Usually this is great. I'm an extreme extrovert, I process information verbally, and I get energy from others. I am never, ever alone. Sometimes you just want to take a deep breath and not speak or listen. Sometimes, you just want to like, BE ALONE. That's why I'm so happy at this very moment. For the first time since I can remember, I'm alone in my house with only Skip, my 12-pound dog. I have big plans for these couple of hours. I'm watching a tv show, and then I'm taking a shower, and then I'm doing some school work. May not sound like much, but it's actually a whole stinkin lot. I'm supes grateful to Dan's parents, Dobby and Doc, for making it happen. They are AWESOME.